Adult Men soccer jerseys, shorts and socks with the new products for a team, or fan. Women's soccer apparel for the female athlete looking for the right fit. Shop out women's cut soccer shorts and soccer jerseys. Long over the calf soccer socks and crew socks from Nike, adidas, Puma and solid socks for teams. Sizes for Toddlers, Children, Women and Men. Official Referee jerseys and shorts from adidas and Official Sports as well as quality economic value referee shirts from Final Decision and KwikGoal. Compression shorts for soccer are great sliders to protect against abrasion. Compression tops for a base layer help to wick away sweat from the body to stay cool and dry. Discount soccer apparel from the top brands available to you at a great price. Soccer Sale items for apparel can be found here. Putting on your favorite soccer jersey, t-shirt, shorts or socks makes you feel good and inspired to go play. With a wide range of Men's, Women's, and Youth apparel you can pick out your favorite item and personalize or customize online with your name, number, logo or sponsor. Men's soccer apparel has the widest range of products to choose from. All professional teams will offer a Men's home jersey to start off their collection. Moreover, the top brands around the world will offer more men's styles of jerseys, shorts, jackets, pants, three-quarter pants and other apparel items. 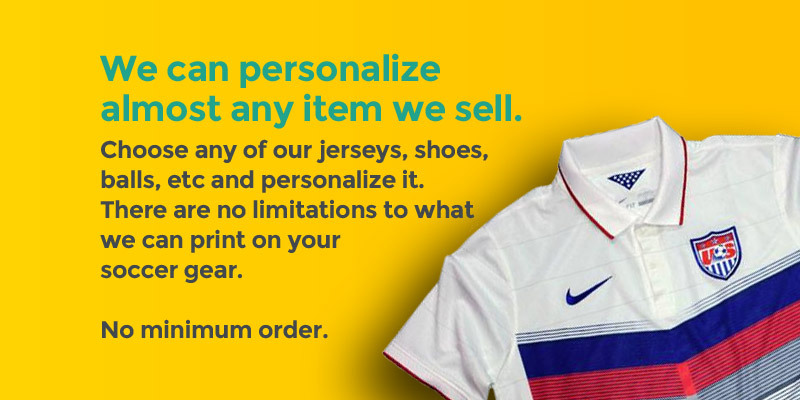 Get custom soccer jerseys or authentic soccer jerseys from your favorite players. Women's soccer gear has various different styles in the way the jerseys, shorts and tops fit. The cut of women's soccer jerseys have a bell shape through the body of the shirt and some are more pronounced than others. Please review each product sizing information to find the right size. We carry official licensed soccer jerseys for women from Nike, adidas, and Puma. Some of the products offered are the official jerseys of the USWMNT (U.S. Women's National Team), Barcelona, and more. We also, women's soccer shorts that can be personalized online. Youth, kids, children or toddler soccer apparel is a growing category. With the ability for young boys and girls to watch soccer on tv it has caused massive interest in the sport and in specific teams. We carry youth soccer jerseys, shorts more fanatic apparel for kids to wear. The material of soccer clothing is mostly polyester. In recent years there has been a big push to make top quality sports performance apparel out of recycled materials. These moisture wicking polyester fabrics can have a wide range of texture and weight, but they are also called out by names like formotion, climacool, climalite, dri-fit, nike-fit, USP Moisure Management, dia-dry, and more. The different variations and brand names fabrics have are determined by the manufacturer and the way the fabrics are used to wick away sweat from the athlete and dry as quickly as possible. Cotton is almost never used in soccer performance wear but can be found in t-shirts. Nylon fabrics are used in jackets, bags, and socks.